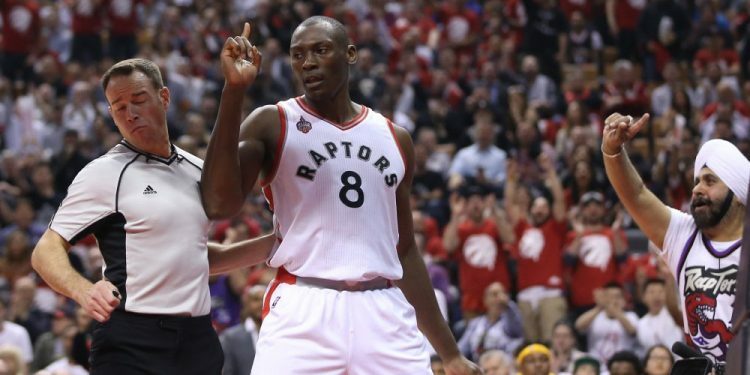 Bismack Biyombo has officially opted out of his contract and will test the waters of free agency, according to Basketball Insiders’ Eric Pincus. Although admitting he would take a ‘hometown discount’ for the Raptors, the big man is expected to earn as much as five times his contract in Toronto, which paid him $3 million last season. This during an offseason where Masai Ujiri has already made it clear that re-signing DeMar DeRozan is their top priority. Despite a modest regular season on the stat line while working behind Jonas Valanciunas for most of the year, Biyombo made a huge statement in the playoffs when Valanciunas went down against Miami, having some exceptional games, particularly on the defensive side. Overall Biyombo’s defence has been stellar all-season, and any team looking to pick him up would be focusing on protecting the rim and improving their defence, as opposed to padding their score line. The Raptors improved from 25th to 11th in overall defensive rating this season with Biyombo in the paint, and went from 25th to 8th in defensive rebounding. All Canada Classic Polls Close Sunday at Midnight, Place your Vote!